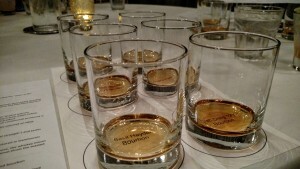 The evening of March 9th, 2016 Seven Lions restaurant and bar hosted their ‘Bourbon Master Class’. The class was led by sommelier and restaurateur Alpana Singh. 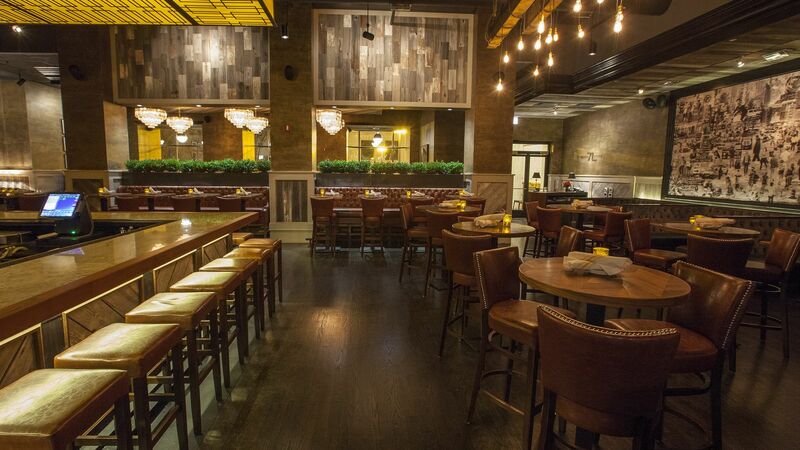 Alpana is the owner of Seven Lions on Michigan Ave as well as The Boarding House in River North and the soon to be Evanston restaurant Terra & Vine. 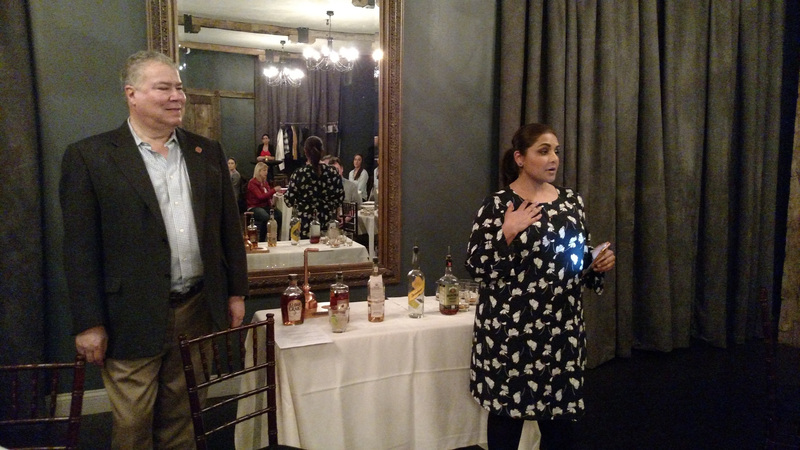 We asked Alpana why she chose to host a bourbon focused event. She said she’s recognized the growing popularity of bourbon and whiskey in the US. Having a longstanding relationship with bourbon expert and educator Mark Gruber didn’t hurt either. Mark, a 35 year veteran of the industry was the primary speaker at the event. Mark is a spirit and wine commentator, educator, and author. He currently teaches wine and cocktail courses at Evanston’s Northwestern University. Alpana kicked off the evening with a warm welcome to the roughly 30 guests and gave a quick introduction to Mark. 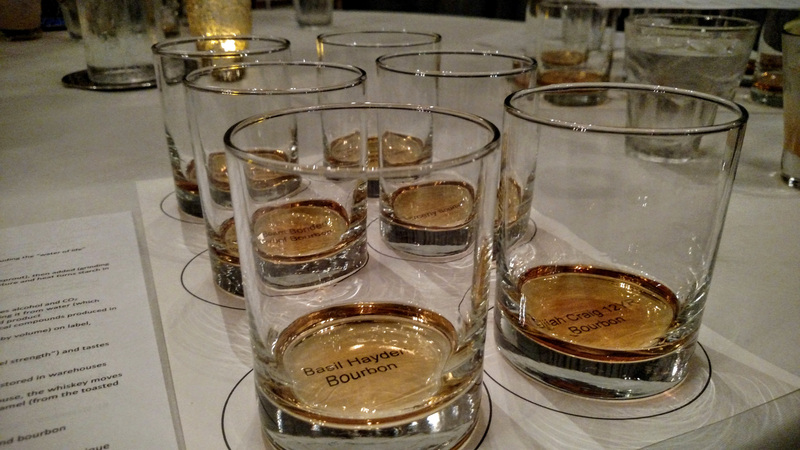 We don’t always know what to expect going into bourbon events billed as a “class”. Will they be promoting specific products? 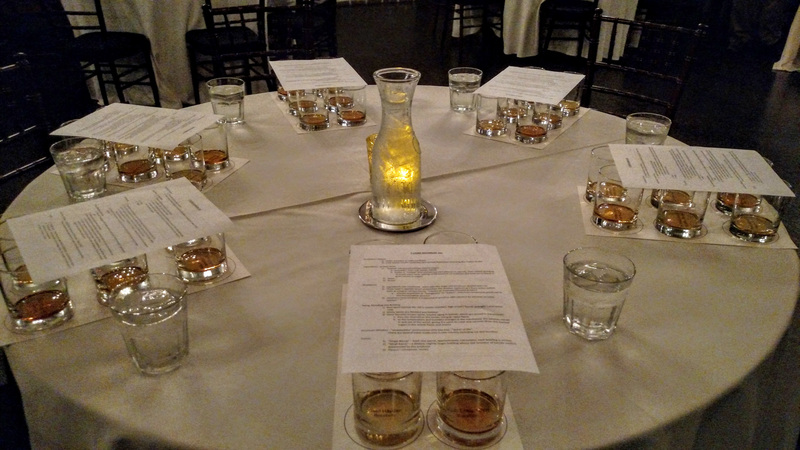 Will it actually be an enjoyable and educational experience geared at those interested in learning more than just the very basics of bourbon? Seven Lions definitely provided the fun and informative evening we hoped for. Mark Gruber did a great job giving an introduction to bourbon, distillation, aging, and blending. He also dived deeper into his expert opinions and evaluations of both process and product. Mark covered a lot of material in just over an hour. He is a wealth of bourbon knowledge and loves to share his passion with others. Just the type of bourbon person we like to meet. 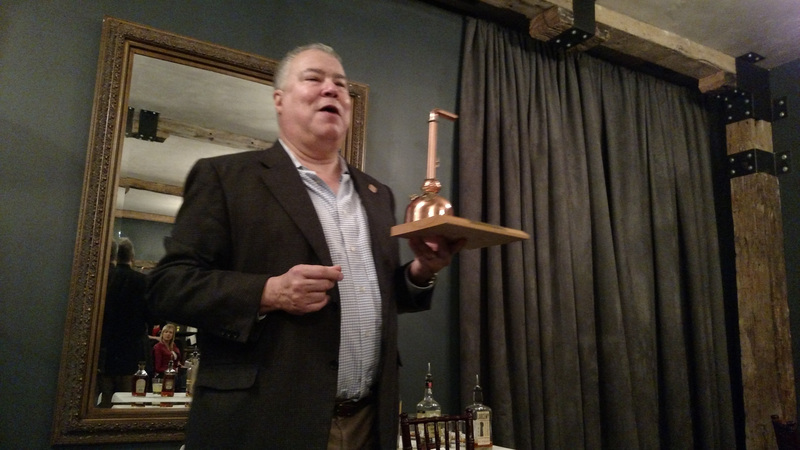 Mark talked about the nuances of aging bourbon in Kentucky. The combination of cold winters and hot summers providing the perfect climate for aging bourbon. These temperature and humidity changes cause the whiskey to move into the barrel wood in the hot summer months and out of the wood in the cooler winter. This exchange is what gives all bourbon its color, flavors, and aromas. New to the Midwest market. This spirit is produced in small batches with local Colorado ingredients. It’s made with 100% malted barley, no corn here, and has a scotch-like flavor. This expression as well as a 4 year old “Diamond Label” are marketed with tin cups over the bottle cap. Making it easy to drink immediately without feeling like you’ve been transported back to your college days of slamming a bottle of Jack. The tin cup may remind you of Tincup Whiskey, also with a tin cup over the cap. Rightfully so as both companies were founded by Jess Graber. Though we’re told the similarities end there. This is a nice whiskey introduction for scotch drinkers or scotch introduction for whiskey drinkers. Also produced by Heaven Hill this bourbon is under a bit of controversy at the moment. The front label used to display the 12 year age statement. The age statement has more recently moved to much smaller print on the back of the bottle. At some point soon Elijah Craig will lose it’s age statement all together as it will be reduced to about 10 years due to high demand. At $33 a bottle this remains an excellent value. If you like it though be sure to grab a bottle with 12 years printed on the label before they are gone. Produced by Beam Suntory this is a high-rye bourbon. Though high rye generally leads to spiciness, being bottled at 80 proof gives this a smooth and well rounded palate. This bourbon was released alongside Booker’s, Baker’s, and Knob Creek as Beam’s “Small Batch” lineup. You’ll notice the other three have a much higher proof. Basil Hayden’s used to carry an 8 year age statement on the label. However, with increasing demand for fine bourbon the statement has been dropped and it is now likely less than 8 years old. This was one of two favorites at our table this evening. Being a “bonded bourbon” this one has been aged at least 4 years. In accordance with the rules it is the product of one distillation season and one distiller at one distillery. It has been aged in a federally bonded warehouse under government supervision. Bonded bourbon is more of a marketing term these days. Though the rules still apply, bonded bourbon was much more popular decades ago when bourbon quality was often in question. Jim Beam bourbon produces a consistent flavor at a low price point. A fine mixing bourbon. A few of Mark’s favorites include Evan Williams Single Barrel Vintage (10 years old) and Maker’s Mark Cask Strength (7 years old). 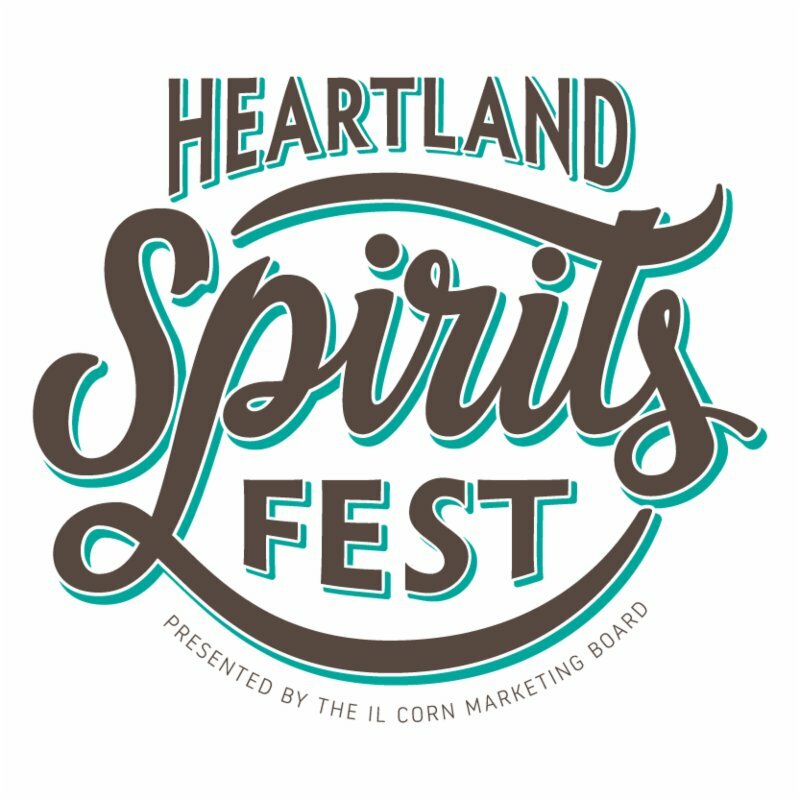 He’s also a fan of local distiller producer FEW Spirits in Evanston, Mark’s hometown. On the very high end Mark is a fan of the Parker Beam Series, specifically Parker’s Golden Anniversary Bourbon, going for upwards of $4,000 per bottle! In Mark’s opinion it takes a minimum of 2 years in wood for a bourbon to be worth tasting. We tend to agree with his interpretation. There really isn’t any substitute for wood and time. This is readily apparent when comparing bourbon to scotch. As Mark shared, a 6 or 7 year bourbon aged in the varying Kentucky climate is comparable to a 14 year old scotch aged in the temperature and humidity consistent Scotland. Time in wood barrels is the single largest factor in determining the quality of the final bourbon. That being said it’s not impossible to get a good flavor out of smaller barrels or less time aging. With the bourbon boom of the last several years we’ve been seeing a lot of new producers hit the market. Many buying already aged juice from large producers such as Indiana’s MGP. But just as many distilling and aging their own bourbon. Being in business for one, two, or four years it’s pretty easy to determine the age of these newer to the market bourbons. While some are less than impressive at their sub 2-year age there are standout producers that have recently surprised us with pleasant young bourbon. Even the new producers with an okay product are worth keeping an eye on. They will continue to release older age statements as their current barrels age. After his presentation Mark hung out and talked with guests. The day after this event we were heading to Kentucky for distillery tours and general tomfoolery. Mark gave us a few recommendations to check out along the way. Jonathan Byrd’s Restaurant in Greenwood, IN and Shapiro’s Deli in downtown Indianapolis, IN. We stopped for lunch at Shapiro’s and it did not disappoint. 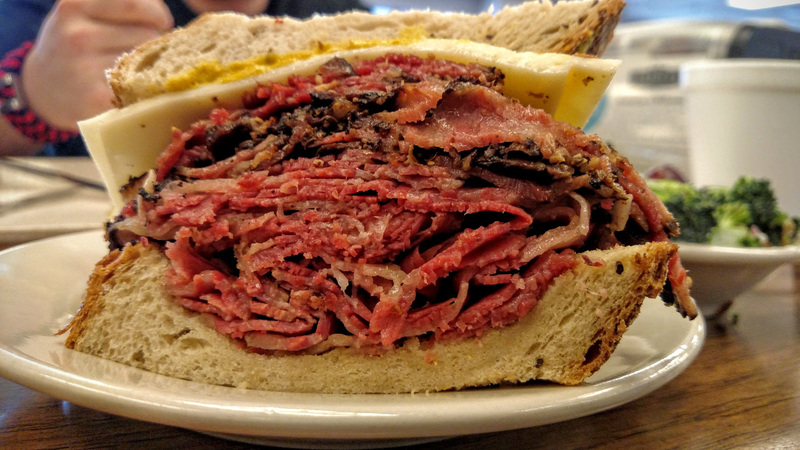 The corned beef and pastrami on rye with swiss and mustard was outstanding! 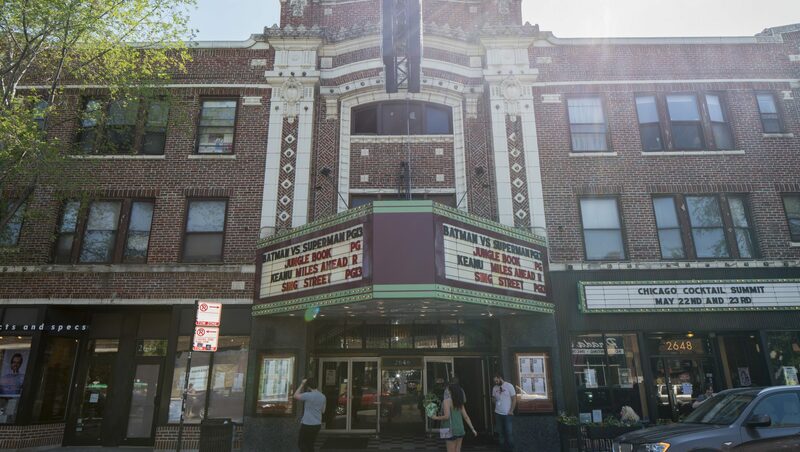 (Forever starred on our personal Google Maps for future visits.) Keep an eye out for an upcoming blog post covering our tours of Buffalo Trace, Woodford Reserve, and Four Roses. Mark mentioned another must visit Kentucky spot for the whiskey enthusiast. The Oscar Getz Museum of Whiskey History in Bardstown, KY. A place to really nerd out on whiskey history. A big thank you to Elizabeth Elliott at IMR for inviting us to this event. And the Seven Lions staff for creating a great evening. 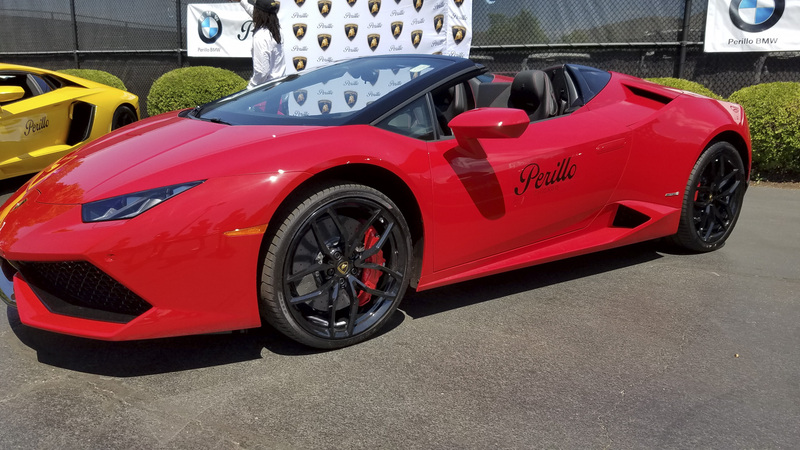 We Celebrated Father’s Day with Bentleys, Bourbon & Bow Ties!